The moon hangs in the sky like the blade of a sickle, giving off a dim glow. A ghostly air permeates the scene, and from a thicket of bamboo emerges the form of a single yurei. An emaciated body wrapped in a kyokatabira, the traditional white burial kimono, this figure is the very epitome of a yurei. Our eyes are instantly drawn to the clenched teeth from which dangles a pale, severed head. Held tightly by the hair, the yurei shows no sign of allowing its precious bounty to drop, and its expression challenges anyone to make it try. And while the eyes of the dead, severed head are closed, the eyes of the yurei look as if they could pop out of their eye sockets at any moment. An unearthly light surrounds the yurei and its head. The scene is blood curdling. The head is painted in vivid colors, but we do not know its story. There must have been some terrible curse, some tragic event, to produce such a terrifying circumstance. Although there are other paintings along similar themes, in this work the artist Kawanabe Kyosai has emphasized the horror, the eerie nature of the image. Kyosai is known as a master of yurei paintings, and surely this is one of his masterpieces. 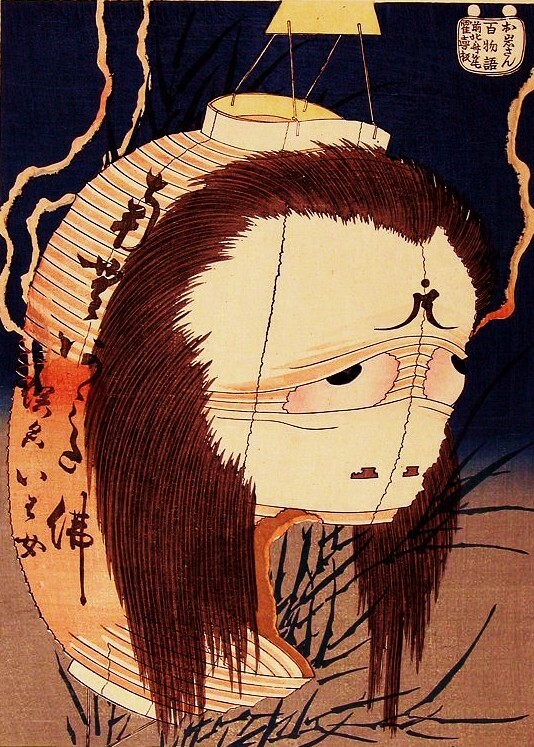 This painting, titled simply Yurei-zu (幽霊図), meaning “Picture of a Yurei,” is india ink on silk and was painted in 1870 – The 3rd year of the Meiji period. The painting is currently housed in the Fukuoka City Museum. The story of this particular painting is not known, and indeed there may be no story. Kyosai painted a few portraits of yurei carrying severed heads. The reason for this is usually related to a story from Kyosai’s youth. As a nine-year old boy, he found a severed head by the side of a river, and brought it home to study and play with it like some discovered toy. When his parents found the head and ordered Kyosai to throw it back in the river, he did so only after he drew the head from every angle, fully studying his gruesome find. On a dark and stormy night Edo night, if you should happen to turn around and see a giant baby dressed in an enormous bamboo hat and carrying a wiggly block of tofu festooned with a maple leaf, don’t panic. Despite the strange appearance, it is only Tofu Kozo, one of the most harmless of all of Japan’s bizarre yokai tribe. 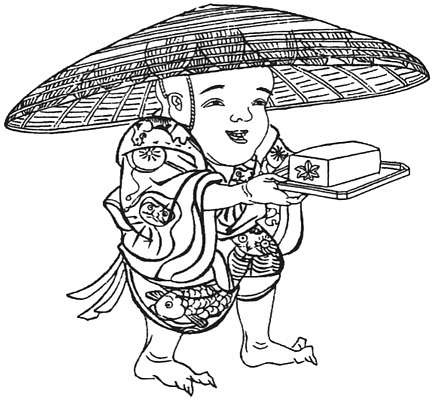 One of Japan’s most popular yokai, the name Tofu Kozo is most commonly translated as “tofu boy” or “tofu kid,” although a more literal—albeit clumsy—translation would be “tofu young Buddhist priest.” But the Buddhist associations don’t run any deeper than the name, with “kozo” being a common term for young boys in Japan. Tofu Kozo generally appears as a small boy, or even a baby, in a giant, conical bamboo rain hat and a traditional kimono. The kimono can be plain, or highly decorated with daruma figures, red rockfish, horned owls, and taiko drums, all of which were thought to be talismans against small pox during the Edo period. As the same suggests, Tofu Kozo are never seen without a plate of tofu, which is decorated with a single maple leaf impression. Lacking any special powers or features other than appearance, Tofu Kozo is said to wander through deserted city streets at night, or during the rain. Generally shy and timid, Tofu Kozo sometimes likes to sneak behind humans and follow them through the streets. There is little agreement about Tofu Kozo amongst writers. Some say that there is only one Tofu Kozo, and that he is a sort of yokai prince, the son of the yokai supreme commander Mikoshi Nyudo and his wife the Rokurokubi. Some say that tofu kozo are nothing more than errand boys for the yokai, rushing back and forth on endless tasks. From the Showa era and up, there have been accounts of Tofu Kozu as meeting people on rainy streets at night, and offering up some delicious tofu. Anyone who eats the tofu finds their body growing with mold from the inside until they die. 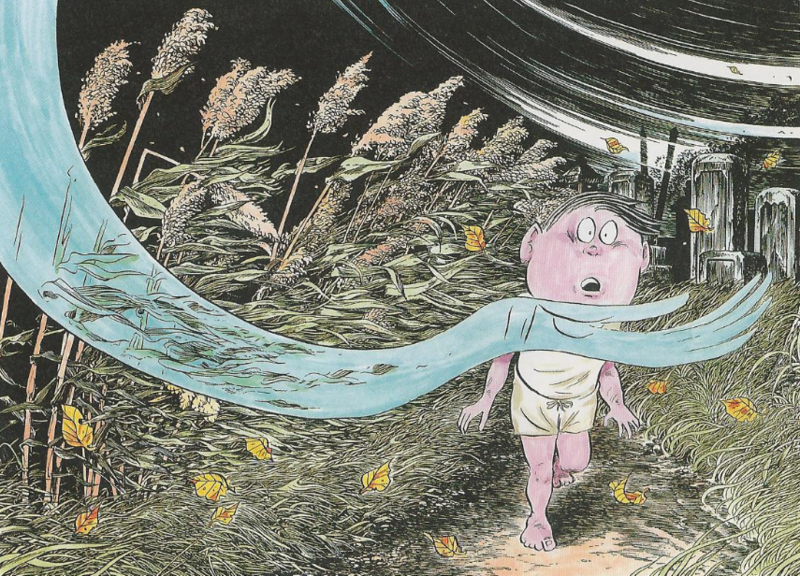 Yokai researchers Kyougoku Natsuhiko and Yamaguchi Bintaro trace this legend as having been invented for for childrens’ books in the Showa era to give the Tofu Kozo a bit more of an edge for modern readers. One the opposite side, in modern Japan therapists have been using Tofu Kozo as a yokai who gets bullied by other yokai, and is used in anti-bullying therapy and education. Tofu Kozo has the unique status of being Japan’s first modern, city-bred yokai. 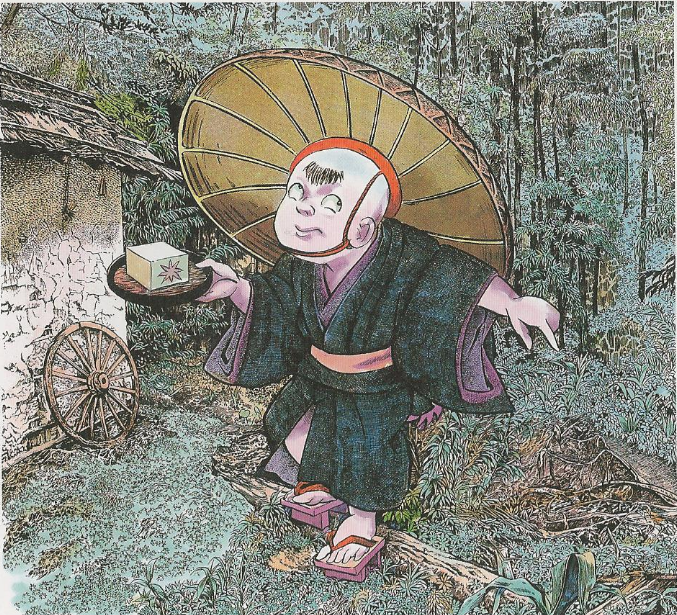 Unlike other yokai that sprang from ancient and rural Japan, the Tofu Kozo has no folklore heritage, no appearances in traditional folktales or legends. 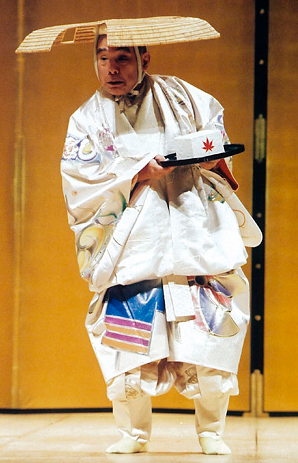 He arrived fully formed suddenly during the Anei era (1772-1781), where he quickly became a popular character for picture books, kabuki performances, toys, advertisements, cookbooks, and yellow-covered kiboshi illustrated stories. There are several theories as to the origin of Tofu Kozo. One aspect is tofu itself. The urban Edo period saw the rise of tofu as a popular food source, cheap and nutritious. 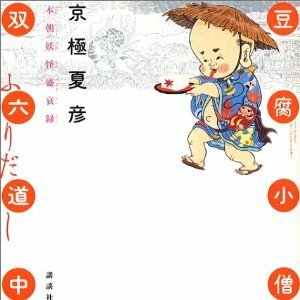 One picture book of the time, Edo Meisho Zue (江戸名所図会) “Collection of Pictures of the Famous Places of Edo” by Hasegawa Settan, shows tofu dealers wearing the iconic conical bamboo hat as they travel the streets back and forth with their wares. Other illustrations from the period show yokai like tanuki and kappa carrying tofu, and it is speculated that some enterprising tofu dealer might have created Tofu Kozo as an advertising character for their shop, only to see the character’s popularity run away from them. Mizuki Shigeru gives the location of Tofu Kozo as Satsuma province, modern day Kagoshima prefecture, although the character is seen all over Japan. During the Edo period, when the 100 candle storytelling game of Hyakumonogatari Kaidankai was popular, game players and storytellers were always on the lookout for new yokai stories to tell, and it is likely that the legend of Tofu Kozo was created and expanded upon during numerous storytelling sessions. 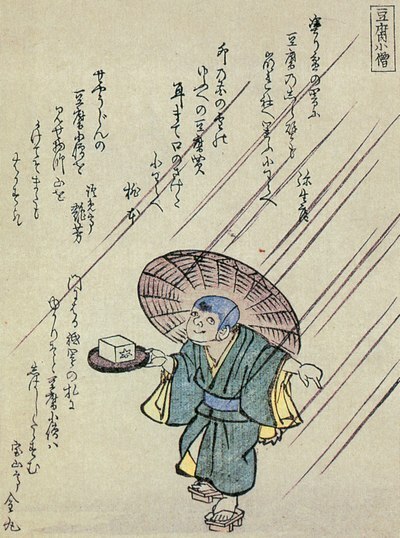 The first known print appearance of Tofu Kozo is in the 1777 kiboshi illustrated book “Bakemono Shiuchi Hyoban-ki” (妖怪仕内評判記; “Commentary on Notable Events of the Yokai”), written by Koikawa Harumachi. A few years later in 1782, he appeared in a popular tofu cookbook called “Tofu Hyakuchin” (豆腐百珍; “The 100 Curiosities of Tofu”) by Hitsujun Ka. The character continued to be popular through the Meiji era. Because there is no traditional origin for Tofu Kozo, artists have depicted him in varying ways over the years. Early descriptions describe him as having an enormous head, like an overgrown baby. Koikawa Harumachi described him this way in “Bakemono Shiuchi Hyoban-ki,” and the artist Kitao Masayoshi even named him Ogashira Kozo, meaning “Big Head Boy,” in his 1787 picture book “Bakemono Chakutōchō” (夭怪着到牒). For a short time, it was popular to draw Tofu Kozo as having only one eye, but this fad soon faded and by 1853 Tofu Kozu was drawn looking like a normal young boy, as seen in the illustrated book “Kyoka Hyakumonogatari” (狂歌百物語). An obvious relative of Tofu Kozo is Hitotsume Kozo, meaning the One-Eyed Boy. Although Hitotsume Kozo is an older, more traditional yokai, over the years the two have come to resemble each other as their stories and appearances merged. This has caused researchers to postulate that they are the same yokai. But while they have had obvious influences on each other—and are depicted as cousins in many modern yokai stories—they are generally considered to be separate characters. In Goto city in Nagasaki, on the morning of the 15th day of the Obon festival of the dead, it was said that an evil wind blew. Anyone who felt the caress of this evil wind would fall sick and collapse. This day also happened to be the traditional day for visiting the graves of ancestors. It was believed that the souls of the unworshiped dead flew on the winds. Since olden times, the people of Japan believed in and feared the unworshiped dead, called muenbotoke ( 無縁仏). Farmers blamed everything from droughts, to strong winds, to infestations of insects on these unhappy spirits. And so, during the Obon festival of the dead, along with the usual offerings of rice and sake to the ancestor spirits of the family, they would try to calm the spirits of the muenbotoke and the Buddhist hungry ghosts, so that they would not lay their curse on any living person. But some of these spirits would not be calmed, and so on the morning of Obon these vengeful souls would take flight on the wind and become the shōrōkaze. It was not just evil spirits that used the wind to travel. The kami spirits of Shinto were also known to flow with the winds. For example, in the middle of March the wind from the East was called the kami-kudashi, and in the beginning of October when the kami gathered in Izumo for their annual meeting it was said that they traveled from all corners of Japan on the wind. And of course, the most famous of all is the kami-kaze, the God Wind that saved Japan. But of these all, only the shōrōkaze is counted amongst the yokai. The Shōrōkaze uses the kanji 精霊 (shōrō – ghost) + 風 (kaze – wind). 精霊 as a term for ghosts is interesting in that it has two different pronunciations, each with different connotations. The most common reading of 精霊 is seirei, and means ghosts or spirits in the Western tradition. When proncounced shōrō, as it is here, the word carries Buddhist meanings. So it is appropriate that the shōrōkaze is associated with Obon, the festival of the dead.